Escape the jail and sneak away the guards like a real underworld don. Go for your freedom. Sin City Gangster Breakout adventure begins with a hard time to escape from a Prisoner jail along with the other lockdown criminals. Seek help from your cell inmates prison breaks expert for a prison breakout mission. Keep switching between prisoners for different skill set. Steal arms and ammunitions to fight for your life. Fight the brutal targeted missions, escape from the inescapable security police chase and use first person shooting and third person shooter skills. Steal lock keys to pick combat tools from the lockers without getting caught. Hack security system to disable security cameras and lasers. Escape in a stolen helicopter, Run & Shoot police officers in Sin City Gangster Breakout simulator! 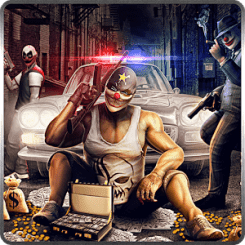 Play Brave criminal thrilling adventure police chase for a greater cause to plan a great crime threat for the city. As a criminal mastermind, recruit villains to help you attack your rivals. Use all the possible tools defend yourself from thugs and kill the cops. Use your driving and flying skills to fly a helicopter that will help you escape the prison island.